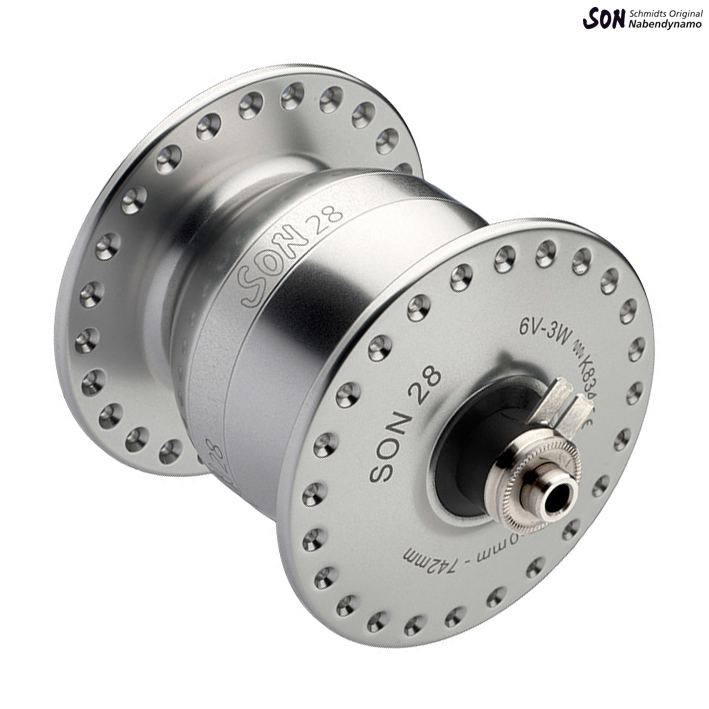 SON 28 is a hub dynamo universally approved for all wheel sizes from 16" to 29". The rated output is achieved in the 700c (622)-wheel at approx. 16 km/h (SONdelux at 19 km/h). Thus, SON 28 is recommended if a lot of light is required at low speed or when either devices are to be operated or their batteries charged. The new SON 28 is reminiscent of the SONdelux in structure and looks. In the standard version (non-disc), the flange distance is enlarged by 12 mm and the bearing distance by 10 mm as compared to the SONdelux. Disc versions are available as 6-hole and as center lock. Compared to the SON 28 klassik (model years 2000 to 2011), the power consumption when no load applied is reduced by approx. 15% and the weight by 140g.